We have projects for all levels and all ages! With adult help, kids as young as 5 can make mini-signs. We offer kids birthday parties that we recommend for ages 7+. For large sign classes, where power tools are used, we recommend an age limit of 12. Our evening classes are reserved for ages 21+ in White Bear Lake. We rate our projects by difficulty level. The difficulty level relates mainly to how much patience is needed to prepare and apply the stencil. What’s the difference between Open Hours and Public Classes? Public classes have a specific start time and are structured like a traditional class. 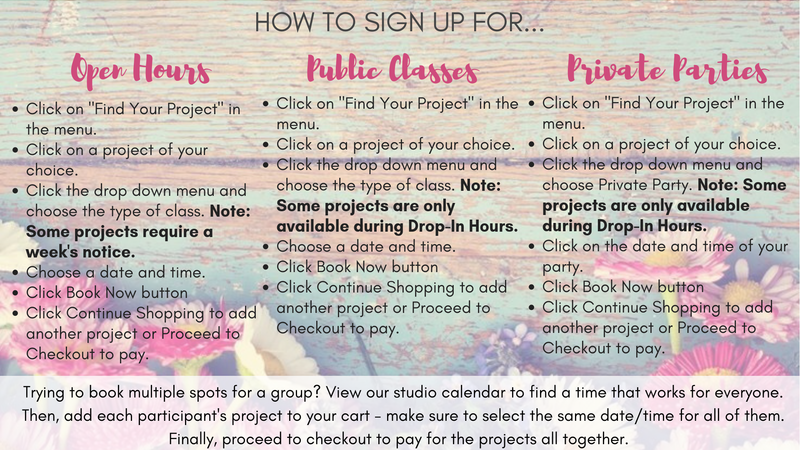 Although the class is centered around one project, there are many design and customization option available. It’s a great option for beginners! We ask that participants pre-register at least 24 hours in advance for classes because we prepare materials prior to the class. Open hours are a less structured time where people can work at their own pace. Various projects are available. Project materials and instruction are provided. You may book your projects ahead of time but walk-ins are also welcome for individuals or small groups. **Custom designs not available during Open Hours unless arrangements are made at least one week in advance. ** We require reservations at least 12 hours in advance for groups of 5 or more. How do I reserve a spot in a Class or Open Hours? 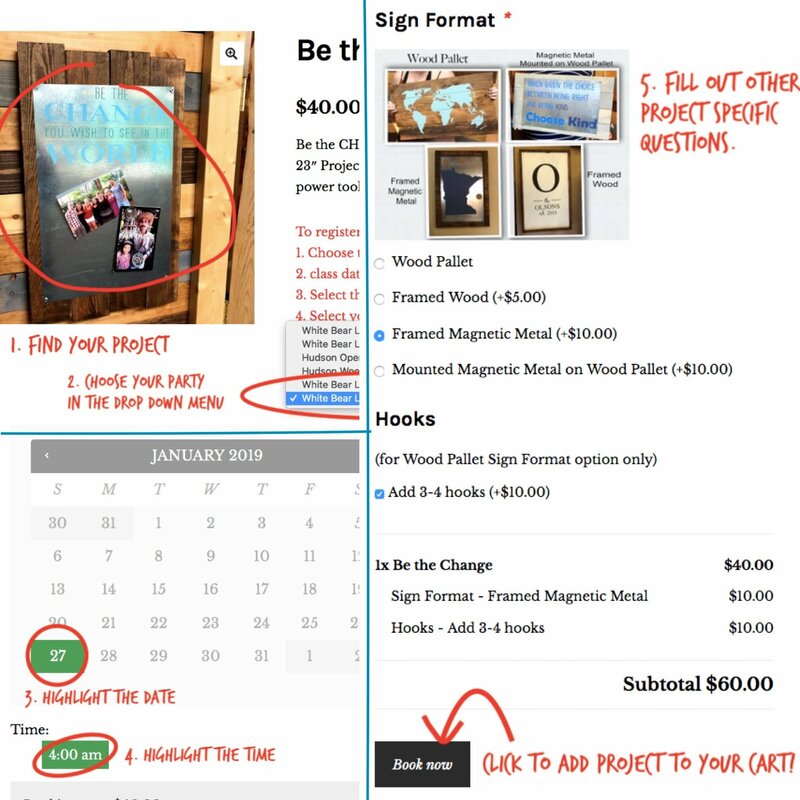 First, you pick out your project. Then you choose your class date and time. Click here for more help registering. Do we actually build the wood projects? Yes, the wood is given to you in its original state and you get to sand, stain, and assemble the whole project with a drill. We offer aprons to wear over your clothing. We suggest wearing short sleeves or sleeves that can be pushed up. Do we get to pick the colors when we make the project? Yes. There are 11 options for stain colors and 40+ paint colors to choose from during the class. Do we free hand paint the design? No, we use custom cut vinyl stencils. Typically, stencils are prepared before you arrive. Can you change the design of the stencils? It depends. Simple changes or substitutions of words within our standard designs can generally be made with no additional charges. Significant changes to our standard designs or special requests are considered custom and must be pre-approved at least a week prior to your class. If approved, a customization fee of $20 will apply. Yes, you are welcome to bring in snacks and drinks to share with your friends. Alcohol/wine/beer is allowed in White Bear Lake only at this time. We do not provide glasses, plates or silverware. What type of stain and paint do you use? We use oil based stains and acrylic paints. If you are pregnant or concerned about the stain fumes, please we can provide a mask. Please ask the instructor upon arrival to the class. Do you host off-site events? It depends. Our space in White Bear Lake holds 12-15 people, our space in Hudson hold 20-25. For larger groups we will make arrangements to provide a class at a local restaurant or event space.